The name Pedrog is probably a variant of modern Patrick. 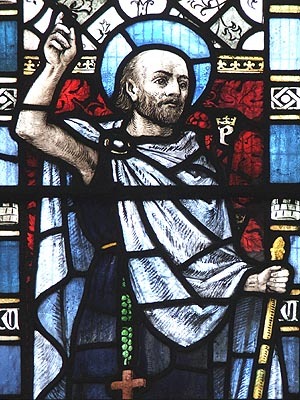 Petroc, as he is generally known in Cornwall where he was patron saint, was a younger son of King Glywys Cernyw of Glywysing. (He may be identical to, or confused with, the legendary King Petroc Baladrddellt (Splintered Spear) of Cerniw). Upon his father's death, the people of Glywysing called for Pedrog to take on the crown of one the country's sub-divisions like his brothers. Petroc, however wished to pursue a religious life and left, with several followers, to study in Ireland. Some years later, Petroc and his band returned to Britain, landing on the shores of the River Camel in Cerniw (Cornwall). They were directed, by St. Samson, to the hermitage of St. Wethnoc who, seeing Petroc's superior piety agreed to give him his cell in return for Petroc naming the place Llanwethinoc (now Padstow - Petroc's Stow) in his honour. Petroc founded a monastery on the site but, after thirty years there, he decided to go on a pilgrimage to Rome, via Brittany. On his return journey, just as he reached Newton St. Petrock (Devon), it began to rain. Petroc predicted that this would soon stop, but it continued to rain for three days. In penance for such presumption, Petroc returned to Rome, travelled on to Jerusalem and finally settled in India where he lived for seven years on an island in the Indian Ocean. Petroc eventually returned to Britain (with a wolf companion he had met in India), but may have gone on a further pilgrimage to Ynys Enlli (Bardsey), founding churches at St. Petrox (Dyfed) and Llanbedrog (Lleyn) on the way. Back in Cerniw, with the help of Saints Wethnoc and Samson, he defeated a mighty serpent which the late King Teudar of Penwith had used to devour his enemies. This done, he departed from his monastery at Llanwethinoc (Padstow) to live as a hermit in the woods at Nanceventon (Little Petherick). Some of his fellow monks followed his example at Vallis Fontis (St. Petroc Minor). It was while in the wilderness that a hunted deer saught shelter in St. Petroc's cell. Petroc protected it from the hungry grasp of King Constantine of Dumnonia and managed to convert him to Christianity into the bargain. Petroc later moved still deeper into the Cornish countryside, where he discovered St. Guron living in a humble cell. Guron gave up his hermitage and moved south, allowing Petroc, with the backing of King Constantine, to establish a second monastery called Bothmena (Bodmin - the Abode of Monks) after the monks who lived there. Petroc eventually died at Treravel, while travelling between Nanceventon (Little Petherick) and Llanwethinoc (Padstow), and was buried at Padstow. The monks there later removed themselves, along with Petroc's body, to Bodmin where his beautiful Norman casket reliquary can still be seen today.